Bhakti Yoga releases samskaras, as Swami Sivananda writes, “Bhakti softens the heart and removes jealousy, hatred, lust, anger, egoism, pride, and arrogance. It infuses joy, divine ecstasy, bliss, peace, and knowledge. All cares, worries and anxieties, fears, mental torments, and tribulations entirely vanish. The devotee is freed from the Samsaric wheel of births and deaths, then attains the immortal abode of everlasting peace, bliss, and knowledge”. In Bhakti Yoga, reaching a state of rasa (essence), a feeling of pure bliss achieved in the devotional surrender to the Divine, is what followers seek. 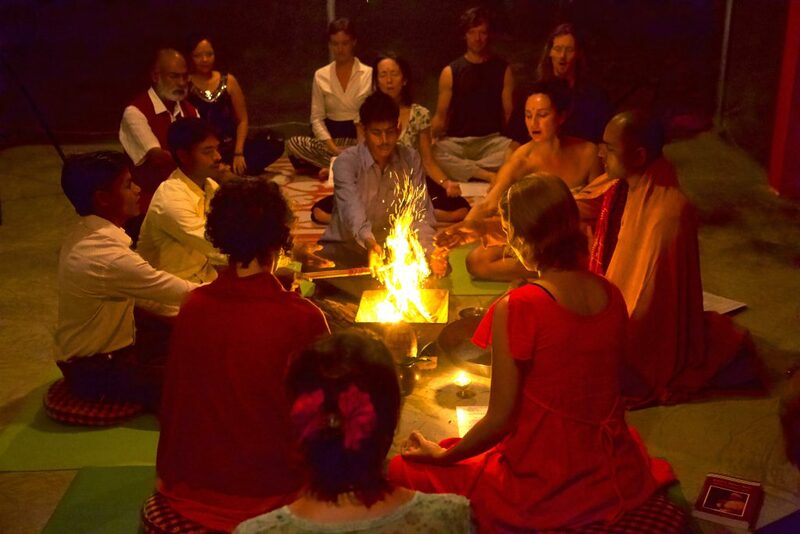 The path to rasa includes particular practices, each one honors the Divine. 1. Hearing/Shravana – “listening” to the ancient scriptures, especially potent if told by a saint or genuine bhakta; Maharaja Pariksit(the last seven days of his life, he constantly heard the Srimad Bhagavatam). 3. Recalling Memory/Smarana – “remembering” the Divine by constantly meditating upon its name and form; Prahlada Maharaja(never forgot Krishna despite constant tortures from his father- Hiranyakashipu). 4. Serving the Lord’s Lotus Feet/Padasevana – “service at the feet” of the Divine, which incorporates the practice of karma yoga (selfless service) with bhakti (devotion); Laxmi, the Goddess of Fortune, is always engaged in serving the lotus feet of the Lord. 5. Diety Worship/Archana – the “ritual worship” of the Divine through practices such as puja (deity worship), and havan or homa (fire offering); Maharaja Prithu used all of his royal possessions in order to offer them in pure devotion to the Lord. 6. Prayer/Vandana – the “prostration” before the image of one’s chosen image or representation of the Divine; Akura offered prayers to Krishna when he was traveling to Vrindavana in order to see Krishna. 7. Executing Orders/Dasya – the “unquestioning” devotion of the Divine involving the cultivation of serving the will of God instead of one’s own ego; Hanuman, the intimate servant of Ramachandra executed all of Sri Ramachandra’s orders despite all kinds of difficulties. 8. Being a Friend/Sakhya – the “friendship” and relationship established between the Divine and the devotee; Arjuna was so close to Krishna, that the Lord offered Himself to become his chariot driver and serve Arjuna and his brothers in various ways. 9. Complete Surrender/Atmanivedana – the “self-offering” and complete surrender of the self to the Divine; Bali Maharaja gave Sri Vamanadeva his entire kingdom, his possessions as well as his own body, although his own spiritual master was against it.